Caribou are facing serious habitat loss and degradation because of the oil industry in Canada. Woodland caribou were once found throughout much of Ontario's boreal forest; at the turn of the 20th century they ranged as far south as northern Wisconsin. The last permanent residents were killed in Minnesota in 1962. Despite periodic sightings of individuals south of the border the caribou range has receded approximately 34 km/decade, the manifestation of widespread range collapse and population decline. Although woodland caribou have been protected from sport hunting since 1929, the Committee on the Status of Endangered Wildlife in Canada listed forest-dwelling caribou in Canada as threatened (likely to become endangered if limiting factors are not reversed) in 2000. Woodland caribou may be extinct before the year 2100 if the rate of range loss continues. "Destruction of habitat, hunting and disturbances by humans during the construction of roads and pipelines are all factors that have contributed to the decline of Woodland Caribou." David Suzuki explained that,BLCN lands cover an area the size of Switzerland and overlap the oil sands. The territory now yields 560,000 barrels of oil a day. Industry wants to raise that to 1.6 million. BLCN land already has 35,000 oil and gas sites, 21,700 kilometres of seismic lines, 4,028 kilometres of pipelines and 948 kilometres of road. Traditional territory has been carved into a patchwork quilt, with wild land reduced to small pieces between roads, pipes and wires, threatening animals like woodland caribou that can't adapt to these intrusions. 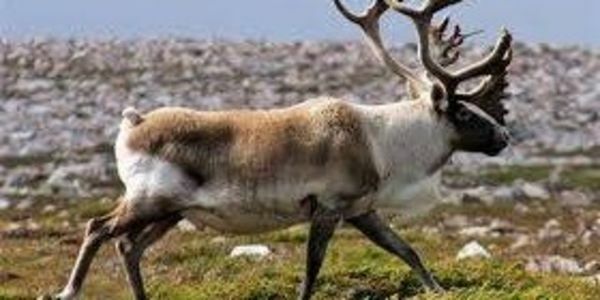 When Environment Canada (EC) introduced the new South Athabaska Sub-regional Strategic Environmental Assessment, it was partly in response to the cumulative effect of oil sands development on the habitat loss of the boreal caribou also known as Woodland Caribou(boreal), Rangifer tarandus caribou. The caribou is iconic and the caribou design on the Royal Canadian Mint quarter was first used in 1937. Ecosystem degradation of the "stands of old growth forest", for example, are caused by "mining, logging, oil and gas exploration and even excessive motorized recreation" which result in "a fragmented and altered landscape often leading to increased populations of deer, moose, elk, and their predators. Caribou require large areas of land with low densities of predators. "The cumulative effect of oil sands development, was one of the topics discussed. It was noted that,[8 The science is clear - all Alberta's boreal caribou are at elevated risk of becoming extirpated (locally extinct), including those in the oil sands region." Since the fall of 2010, the Alberta government has been working closely with the federal government, through Major Projects Management Office (MPMO) on system-wide improvements in regulatory activities to align with the Canadian Environmental Assessment Act (CEAA) and to engage Alberta on energy and environment issues. On 3 February 2013, a joint Canada-Alberta world-class, comprehensive and integrated monitoring system of the oil sands was announced. Through the South Athabaska Sub-regional Strategic Environmental Assessment, the Government of Canada and Alberta will "further align regulatory processes, while addressing cumulative effects by employing an ecosystem-based approach. "On 11 May 2012, the briefing notes for the meeting with Suncor VP and Environment Canada included EC's concerns for the cumulative effects of oil sands development. "Environment Canada is not only concerned with the environmental impacts of individual oil and gas projects, it is concerned with the cumulative effects of development, especially in the oil sands and urban centers. Impacts are not limited to air emissions. Terrain disturbance, disruption of groundwater regimes, and contamination of surface waters are all concerns, particularly with the accelerated pace of development." By February 2013, Suncor's March report reflects their concerns with the Species at Risk Act (SARA), in particular on the implications of theProposed Recovery Strategy for Woodland Caribou. Suncor reported that, A number of statutes, regulations and frameworks are under development or have been issued by various provincial regulators that oversee oil sands development, including the recently announced Joint Canada-Alberta Implementation Plan for Oil Sands Monitoring, and the Lower Athabasca Regional Plan (LARP) that implements a cumulative efforts management regime in the Athabaskca oil sands region. These statutes, regulations and frameworks relate to such issues as tailings management, water use, air emissions and land use. While the financial implications of statutes, regulations and frameworks under development are not yet known, the company is committed to working with the appropriate regulatory bodies as they develop new policies, and to fully complying with all existing and new statutes, regulations and frameworks as they apply to the company's operations." This petition has reached 76, 000 at 80,000 It with be sent Julie Payette General Governor of Canada, Canada. Thank everyone for your support .